Posted on June 14, 2017 Categories BLUE ZONES PROJECT, FOOD, GARDEN WORK, GARDENSLeave a comment on “Blue Zones Project” Coming Our Way! In 2005 I bought this sweet small house on an acre of land consisting of nothing but a’a lava rock. Then in May of 2008, I started this blog. 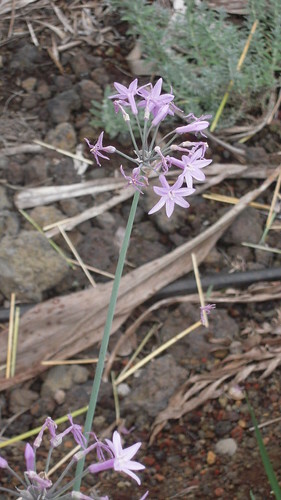 I began to share photos and write about how that acre of lava was developing (or not developing). Since late spring of this year, I was given a home that is closer to the college where I teach, closer to town, and has land that will actually grow something. It is still rocky, but the lava has decomposed enough that it manages to provide more of the lush greenery for which Hawai`i is known. While I lived in Ocean View, I complained about not being able to grow anything, or at best what did stay alive was growing at a snail’s pace! Now my complaint goes in the opposite direction – everything grows too quickly! This view into the side yard was taken in April. Two months later in June, it was so overgrown that no one could walk through it! 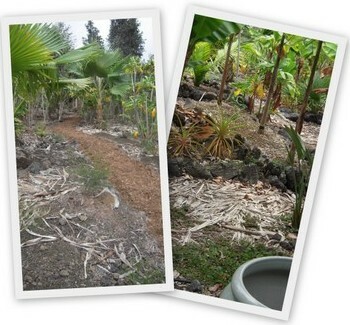 There is a lot of work to be done still, but with the help of some friendly landscapers, it is beginning to take shape. I’ll post more pictures as things start to look beautiful again. I look forward to cleaning out this little area with its raised beds. 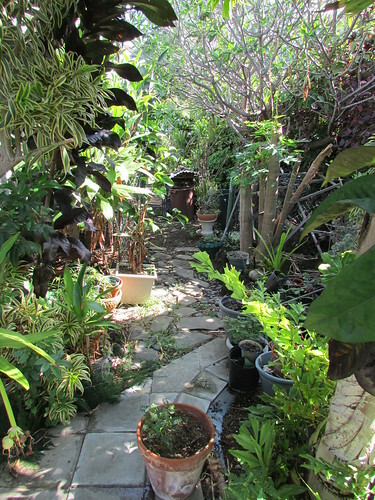 It is a perfect spot for growing herbs, or starting seeds, or potting seedlings, and more. The purple sweet potatoes growing here were probably from starts the previous owner was tending. I will transplant some of those into a backyard garden. 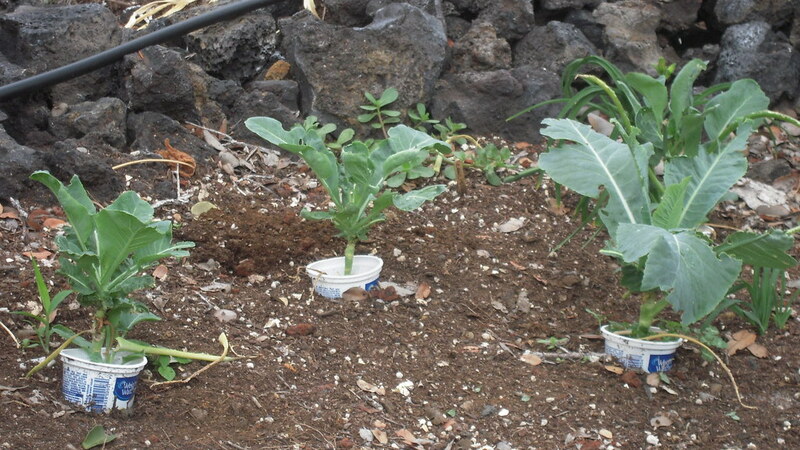 Friends have given me lilikoi seedlings and several white pineapple plants. So much to look forward to here! 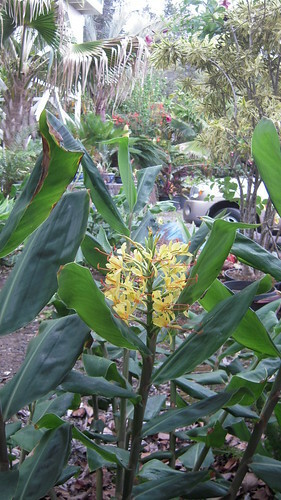 Posted on July 23, 2014 Categories A`a Lava, GARDEN WORK, GARDENING, Hawai`ian Gardening, LANDSCAPING, Raised BedsTags A`a Lava, GARDEN WORK, GARDENING, hawaiian gardening, LANDSCAPING, Raised Beds4 Comments on New Home! Our Big Island Self-Sufficiency group (BISS) here on the Big Island meets quarterly for a potluck and to share or exchange seeds, plants and cuttings. Other people there took lots of pictures, but you can see pictures I took at last year’s gathering here. 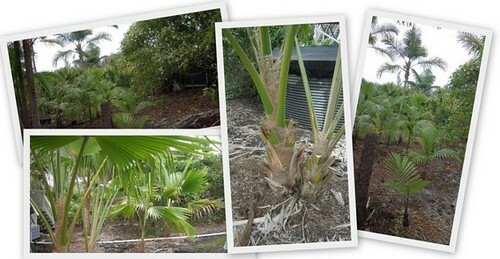 Kele’s garden is still full of banana trees and various tropical plants that would fill any gardener’s heart with envy! Needless to say, the food was excellent! I came away with several small plants and a bag of various seeds. Some of the items were new to me, like these. 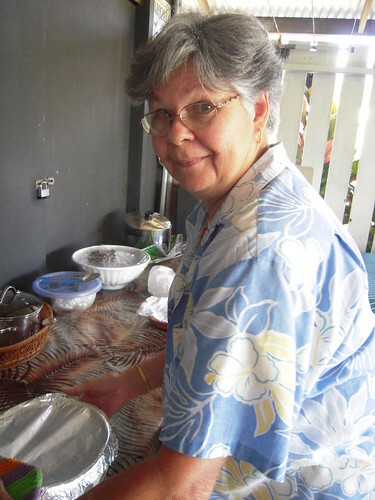 Sonia is another garden and food blogger. She makes sure everything is in its right place! “Hot dishes go here, cold dishes go here, and desserts are over there – and I’m so happy you could join us!” Be sure to check out her blog from yesterday to find out a bit of the history behind BISS, and see more pictures from our gatherings. This year, several of our members brought musical instruments to jam. I was able to get a couple video clips of them playing. Ignore the background chatter of all the people (65 people showed up!) 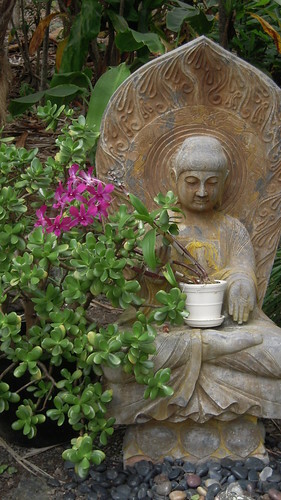 in this YouTube, and you might hear the music that reminded me of my old “hippie” days in California. My little camera may not produce the finest fidelity, but the music was good toe-tappin’ stuff! Peter played Mandolin, Altar played guitar (sometimes they switched), Phil played banjo and harmonica, Melanie played violin. 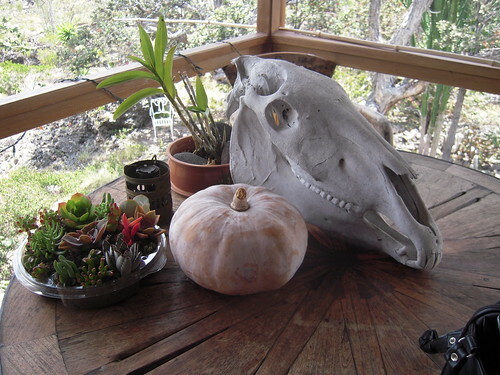 Peter and Altar are from the Akaka Pit Stop where you can buy fresh fruits and veggies from their farm when you are on the Hilo side of the Big Island. Be sure to check out their website and tell them I sent you! 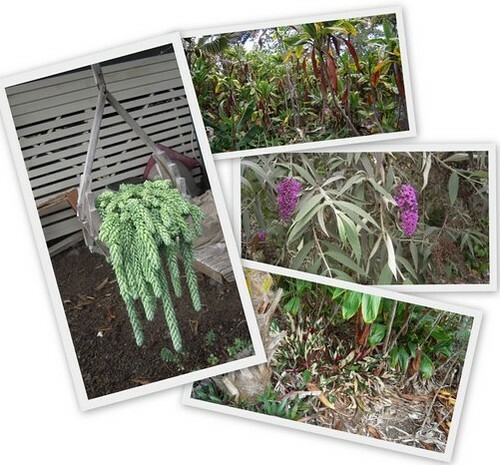 One of my intentions since the beginning of this blog almost three years ago has been to show readers what some of our local residents have managed to create on their acreage, and what they are doing to make it livable as well as beautiful. If you want to see some of these past posts, go through the categories on the right hand column of this blog. The Southern end of the Big Island of Hawaii is not exactly the luxurious tropical atmosphere most people envision when they think of Hawaii. 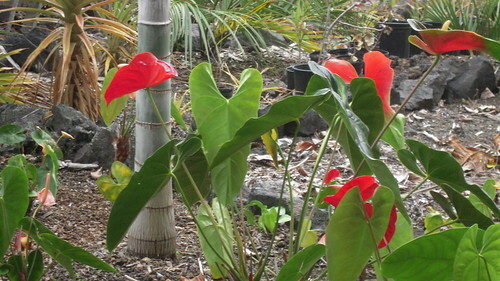 Here, every bloom is nurtured and prized, every square inch is utilized as much as possible. 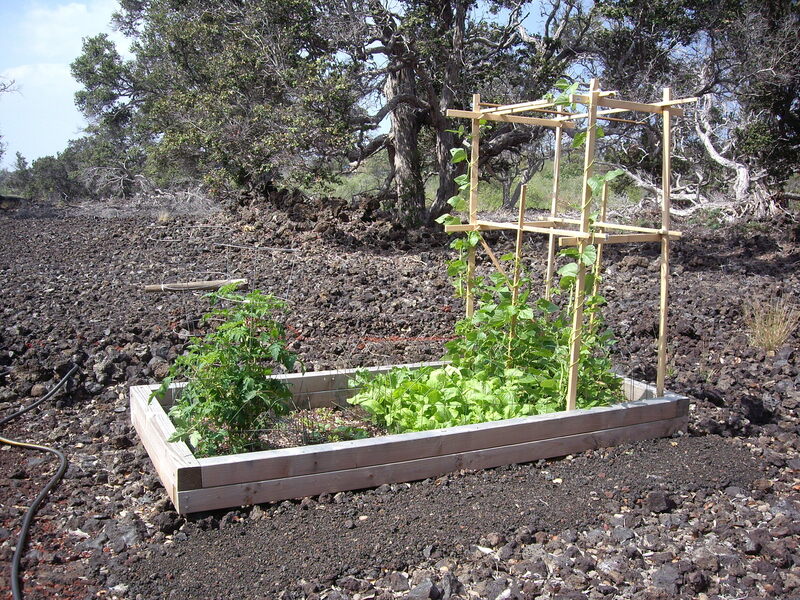 Many of my posts talk of the challenges we face when we try to garden on our a`a lava. 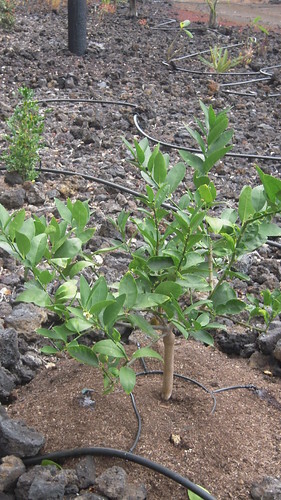 It is a constant process of finding which plants will survive during drought or heavy rain, coping with toxic air full of sulfur dioxide from the volcano, sheltering our plants from the strong trade winds, and working with minimum soil that we (mostly) need to make ourselves out of compost. 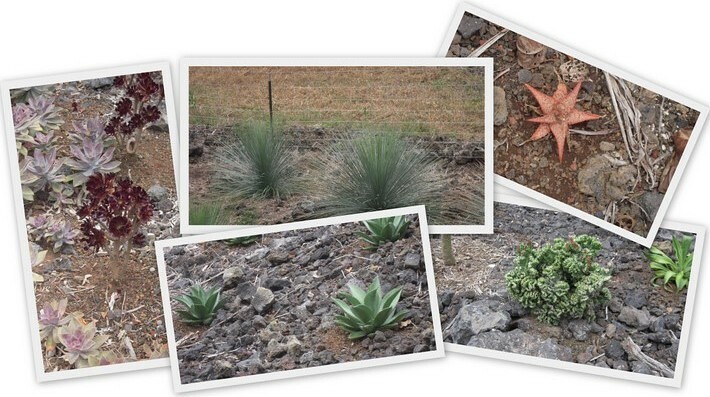 Little by little, our lava beds can become works of art. 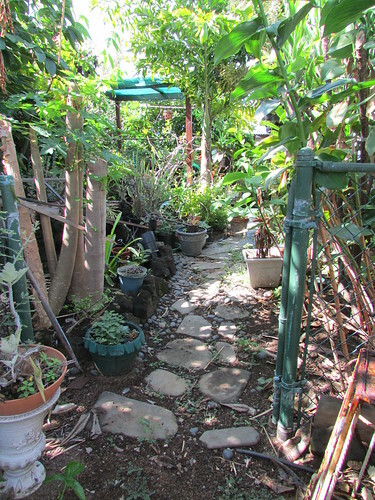 Recently, our Ocean View Garden Club visited another local property that exemplifies the creativity that is possible here, in spite of harsh circumstances. Plant art, found art, junque art – all are at home here and work together to form an oasis of beauty. Click here to view a slide show of what is possible when creative minds are put to work. 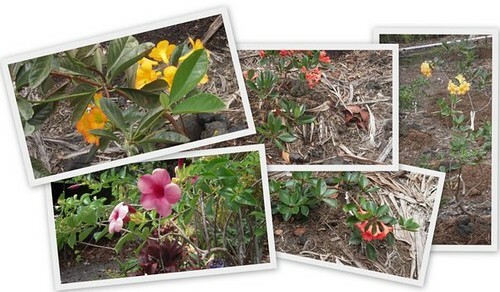 Mahalo to those of you who have sent condolences about my drought-ridden garden! I have a tendency to get discouraged, and wonder if we will ever get rain. It looks like I’ll need to order my fifth load of water for the catchment tank this next week, unless we get a heavy rain in the meantime (which doesn’t look likely). Mostly it’s been my vegetable garden that has suffered. I can’t seem to get enough water on them, no matter how hard I try. My attempt to conserve water for personal use (like bathing, flushing, and cooking) means I can’t water as often or as deep as I’d like. What my veggies need is a nice overhead soaking from the skies. Anyone know how to teach me to do a rain dance out there?? 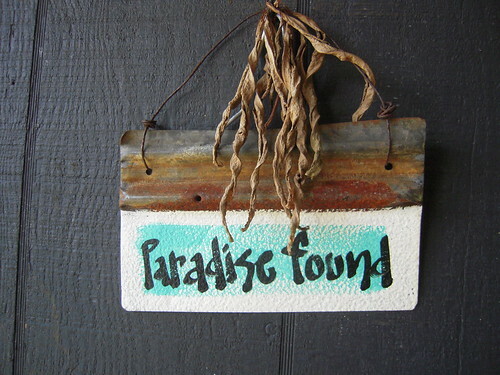 All is not lost, however. Like the new sprout at the bottom of my red ti plant above, there is still life. For some strange reason, my flowers are doing well. There is just enough of a mist occasionally to keep my brilliant nasturtiums blooming and spreading. 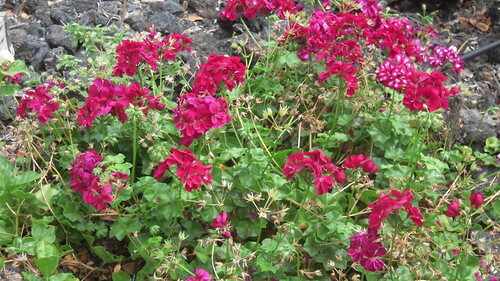 The geraniums don’t seem to need as much water as other plants. In fact, these magenta ivy geraniums are going crazy. 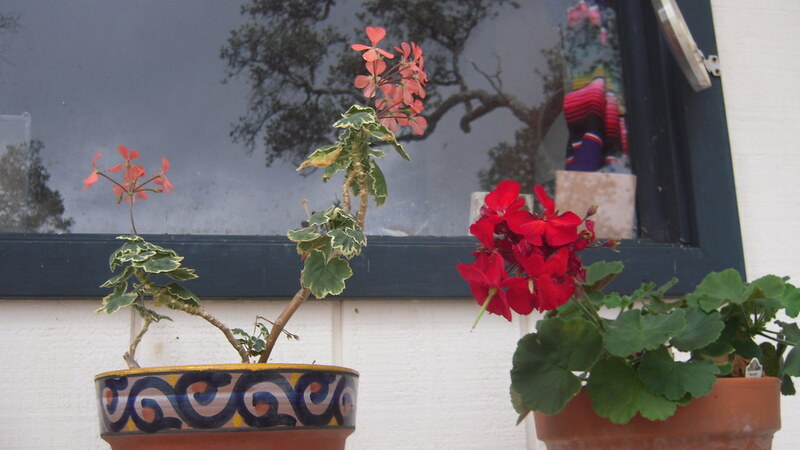 I need to do a “dead head” job on them, but they are a gorgeous spot of color from my kitchen window. 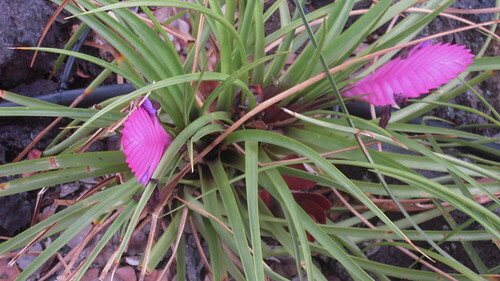 The pikake blooms are sweet smelling and provide a nice contrast to the magenta behind them. 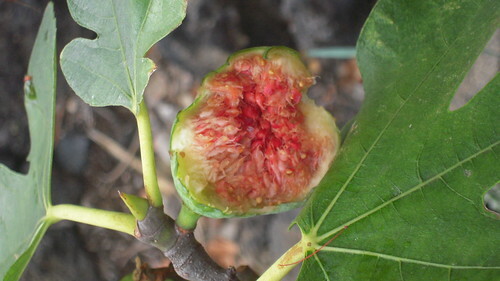 I’ve tried to pick my figs regularly, even though I only get one or two a week. They are a little morsel of flavor. Perhaps someday I’ll get enough to actually make some fig jam! I was about a day too late to pick these two. The birds got there first. 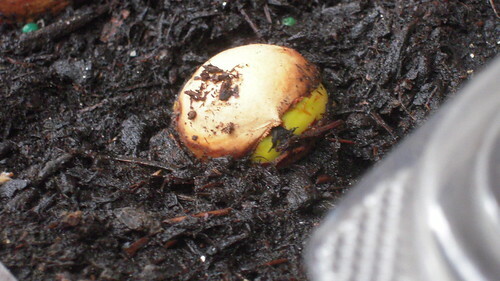 Most everything that is in a pot seems to have fared much better, but even then they need a constant watching. 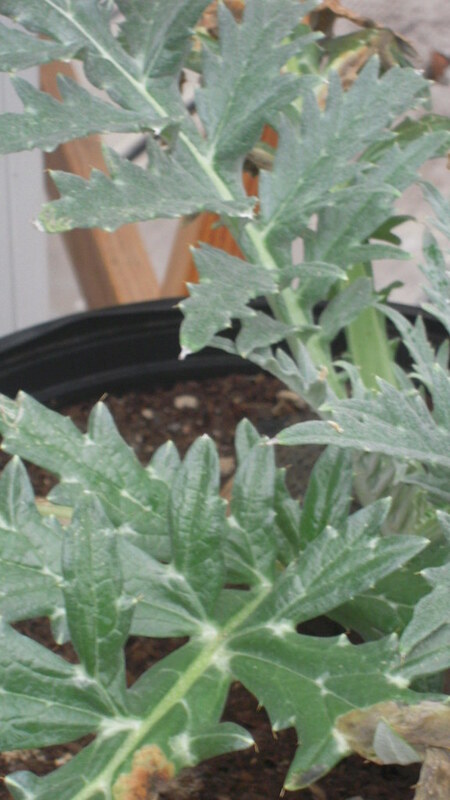 I have two of these cardoon (also called artichoke thistle). It is a relative of the Globe Artichoke (Cynara cardunculus) and is grown for its stem, which I assume is cooked up for eating. I’ve never grown this before so it will be an interesting experiment. Does anyone know if the thistle can be eaten like a regular artichoke? These four basils grown in pots are doing well. 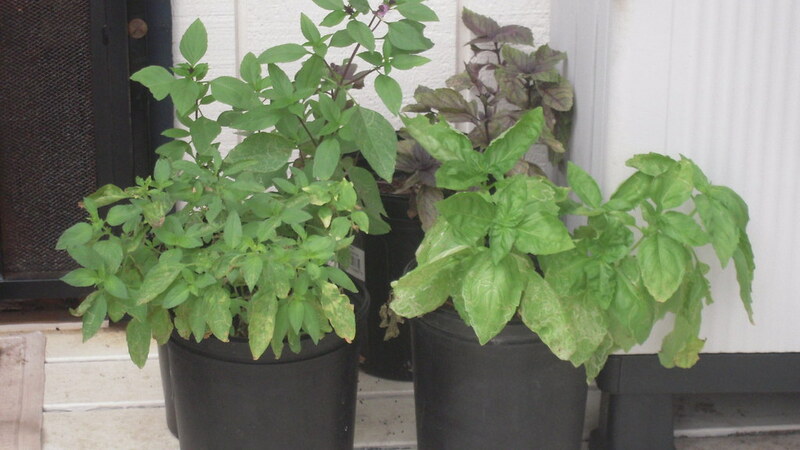 They are purple basil, lime basil, cinnamon basil, and sweet basil. They are right outside my kitchen door for handy use. 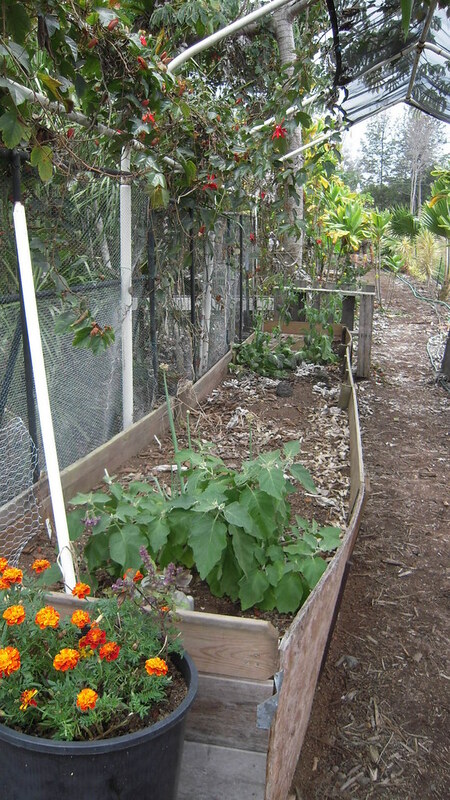 The basil I planted in the ground was eaten by birds before I even had a chance to cover them with netting. Fast and hungry critters, they are! 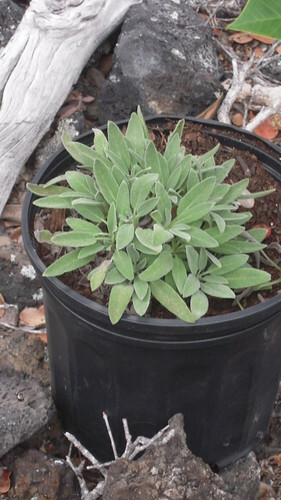 This broad-leaf sage is doing quite well in a pot. I transplanted it from the ground in order to keep it going. It was starting to die in the ground, but has made an amazing come-back. 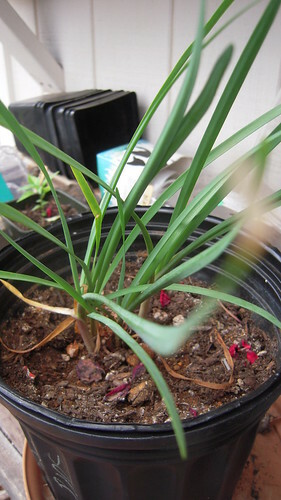 This little society garlic is in a pot for now. I may move it to the ground somewhere once the rains come. 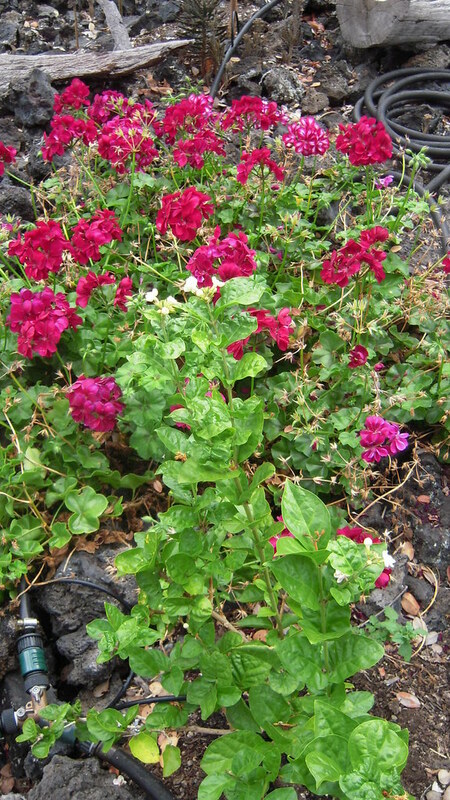 Plants like hibiscus and geraniums don’t have much trouble surviving. 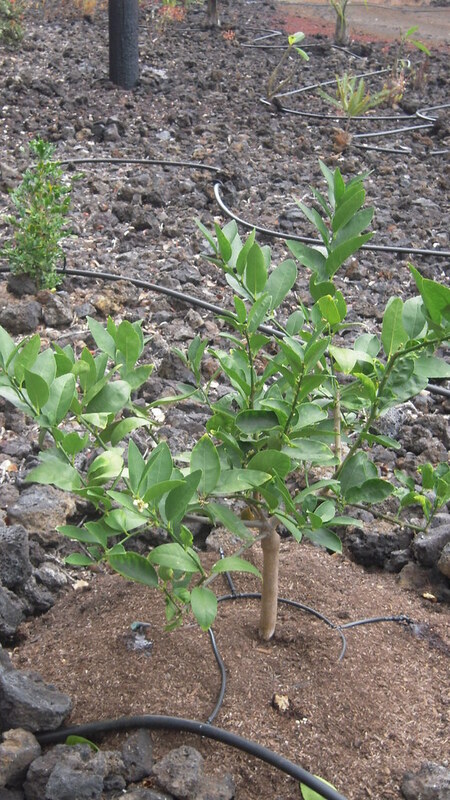 The lime tree was taken out of a large pot and put into the ground a couple months ago, and it’s doing well. There are already new blossoms on it. I tripled the number of drips going to it since the palms and bromeliads (on the same drip system) didn’t need as much. I planted several stems of this purple flower and those have taken root quite well. They are now providing me with lovely blooms. 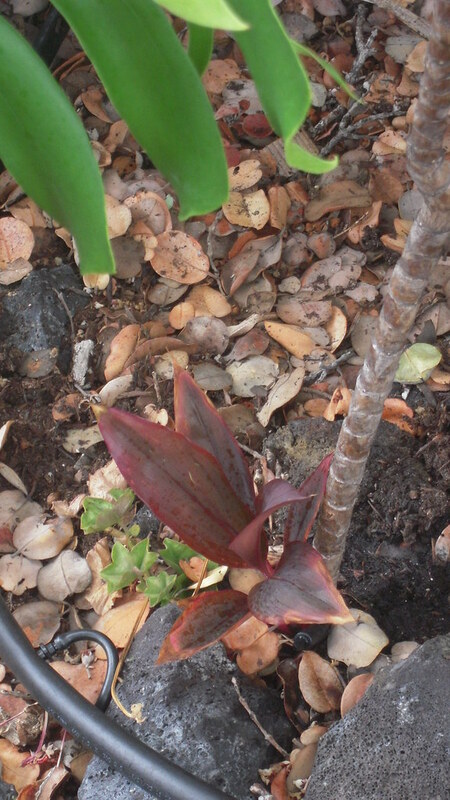 Many friends say they have this plant, but don’t know the name of it. If anyone can tell me, please write! This was another twig given to me. 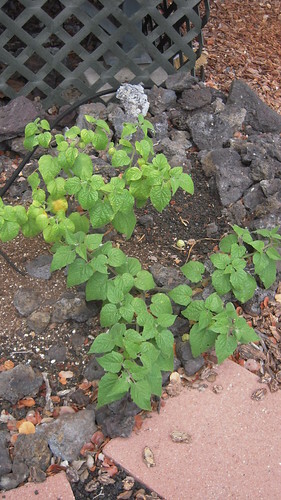 There was a bunch of this growing in Monty’s and Bob’s garden that I wrote about a few weeks ago. Bob called it “Jessup” but I haven’t been able to find anything about it on Google. I keep getting sent to people and places, but not to a plant. Another one that I don’t know. Any suggestions? 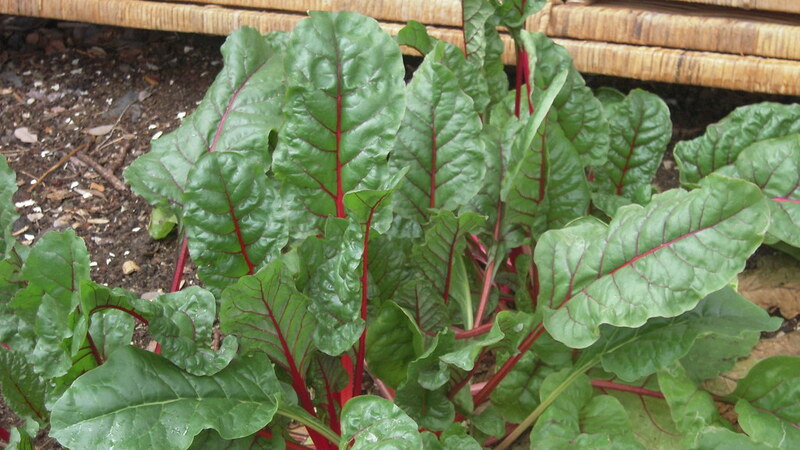 Of course, I find it impossible to kill my red chard. It tastes so good in a quick stir-fry with garlic and olive oil. For every leaf I pick, two more come up! A small patch of this keeps me in good greens. This poha (Cape Gooseberry) is growing quite well, too. I’ve been saving up some of the berries to plant so I can get more bushes. I just had a bowl of poha ice cream in downtown Kona this past week. Absolutely wonderful! 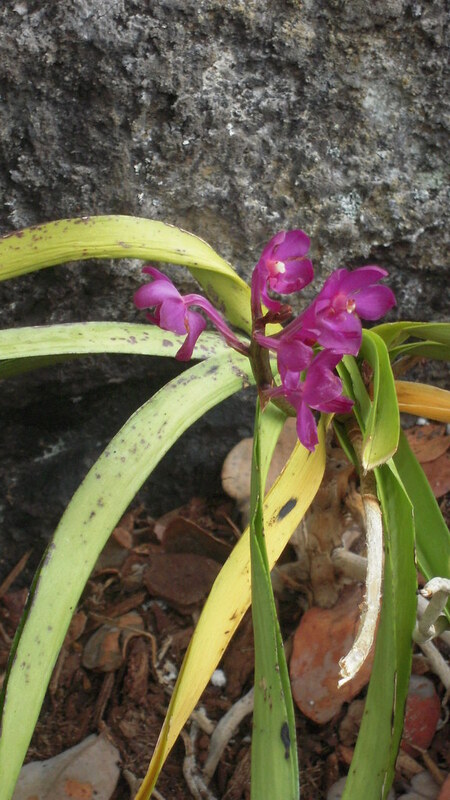 The leaves on this petite orchid don’t look healthy, but the delightful blooms (less than an inch across) are poking out to be admired. This tri-color stromanthe is managing to survive. I love the three colors of this striking plant. 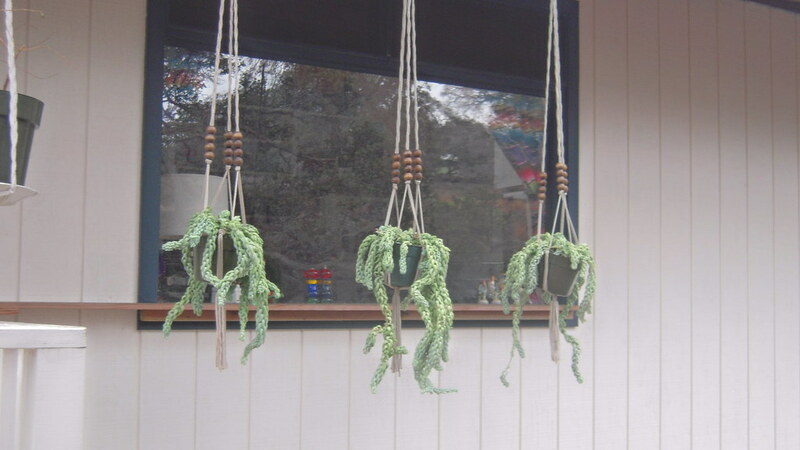 At last, these three donkey tails found a home in hanging planters right outside my dining room window. They sat on my front steps for over a year, so some of them are not hanging down as straight as they would ordinarily. They have not needed much water to keep growing. Maybe as they get longer and heavier, they will straighten out. Out of all the seeds I planted of this Thai hot pepper, only two survived. I gave one to a friend as a gift, and this one I’ll keep. 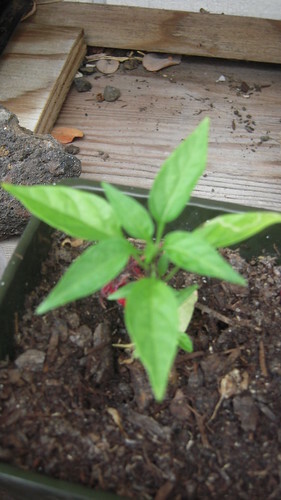 Last year, I got dozens of peppers from one plant and since only one or two of these tiny peppers are more than enough for a good hot flavor, one plant is probably enough. I’ll put this in a larger pot next week. 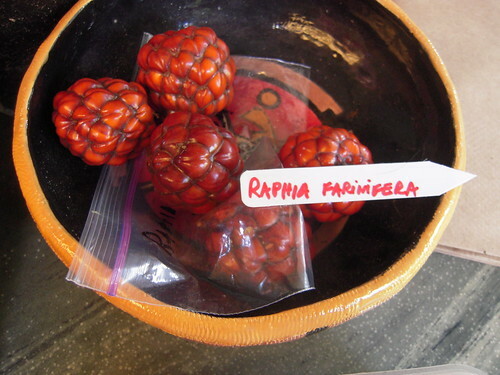 I have about six or seven of these seeds for a Sago Palm (Cycad) that were harvested by a friend on Maui. 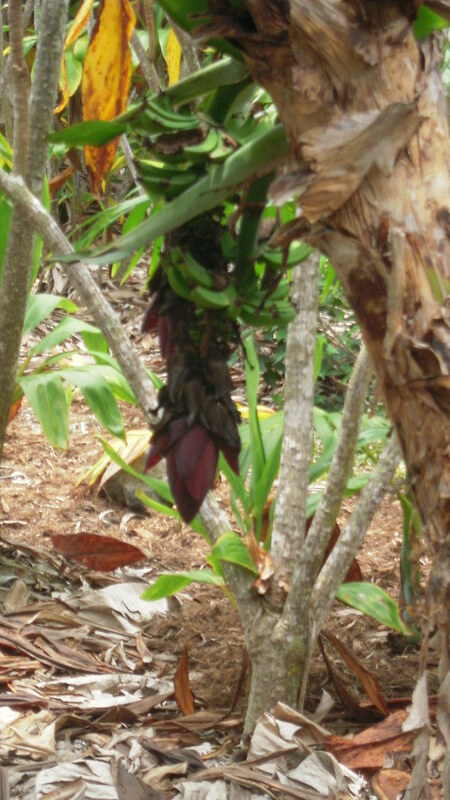 They had to be soaked, then stripped, and planted on their sides, half-way submerged in soil. They are starting to split and this one is even showing a bit of green. 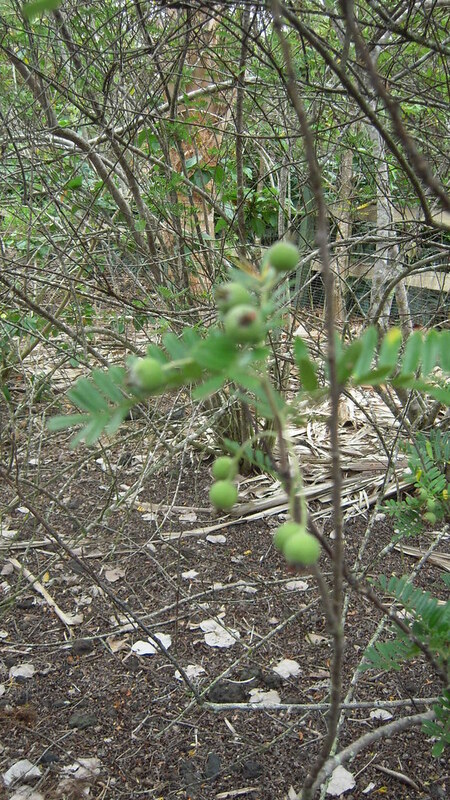 They are very slow growing, so maybe my grandchildren will see a plant from these seeds. This is an autograph tree given to me by a colleague. 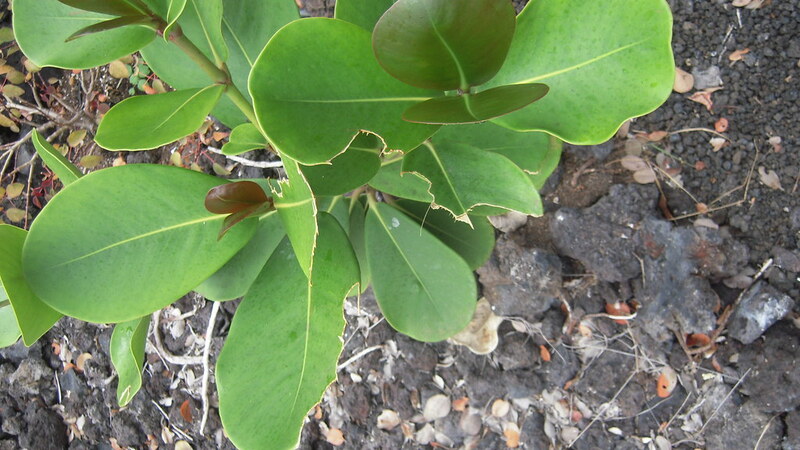 It has been growing nicely, but you can see that something bigger than a bug (probably the mouflin sheep) has been taking huge bites out of the leaves. 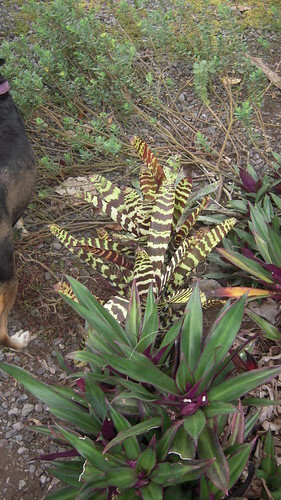 Animals are looking for anything they can find that might provide them with a little moisture. One triumphant story is the cauliflower. Just a few weeks ago, I went out to find the leaves stripped down to the center vein. Most people have agreed that it is more than likely the caliche pheasants. I continued to water them, wondering if they would revive. Voila! They have huge leaves again and just might make it. I’ll try to put something over them so the caliche won’t get them again. So that’s the latest from the lava field. My posts have slowed down a bit lately, but each fall semester, I teach five college courses. That takes up most of my spare writing time. Once I’m back into a good rhythm of school, I’ll do better. 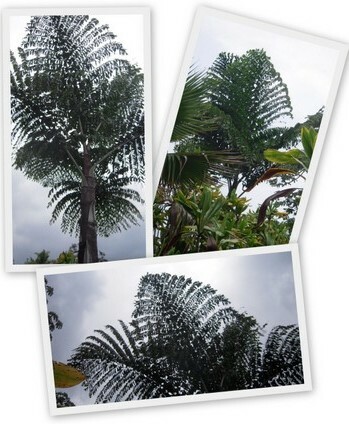 Posted on September 25, 2010 Categories Chard, FLOWERING PLANTS, FRUIT, GARDEN WORK, GARDENING, HERBS, Sago Palm, TiTags chard, FLOWERING PLANTS, FRUIT, GARDEN WORK, GARDENING, HERBS, Sago Palm, ti4 Comments on All Is Not Lost! Two of my favorite landscapers (Bob and Monty) invited a group of us “tree huggers” to come tour their garden. 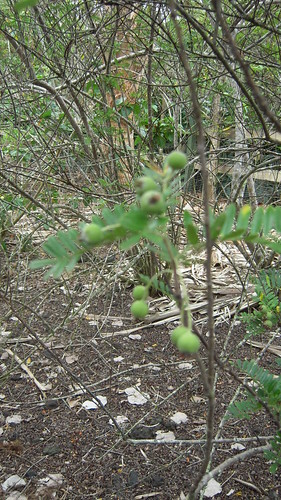 Since the land on their property is much like that of Ocean View, I gathered lots of how-to ideas on what to grow and what not to grow. 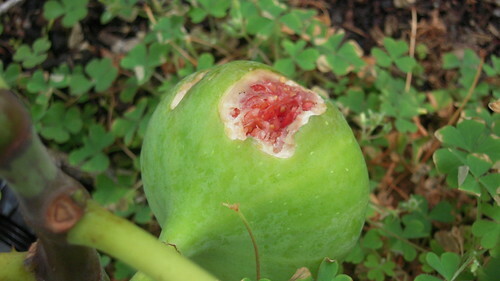 Since I have said this post is about gardening from A to Z, I suppose I’d better start with A. The rest of the alphabet will be mixed up, however, and maybe I’ll end up at Z! 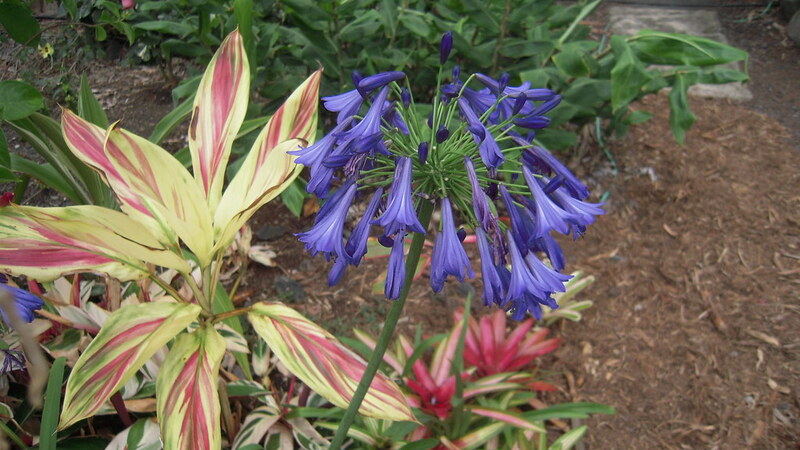 I love these large deep blue Agapanthus, shown here in front of Stromanthe. The Agapanthus in my garden is smaller and more of a baby blue. 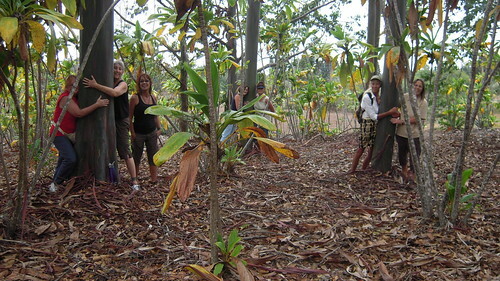 The guys have concentrated their efforts on saving the native Hawai`ian trees, like this tall ‘Ohe Makai by their gate. 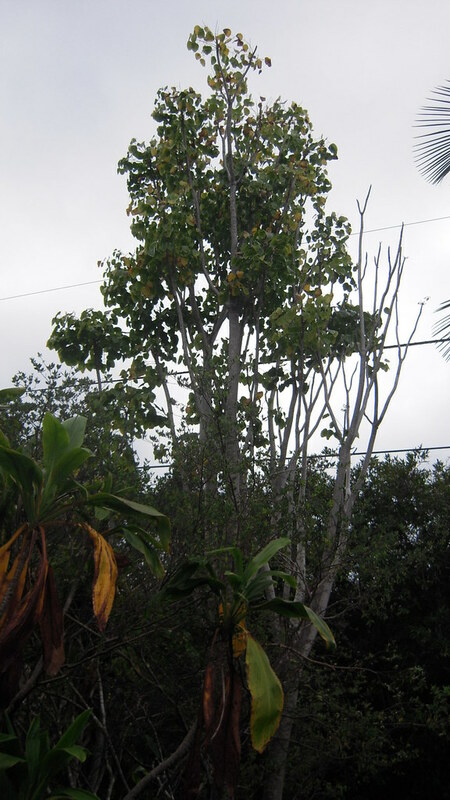 Like many of the Hawai`ian natives, this particular tree is on the endangered list. 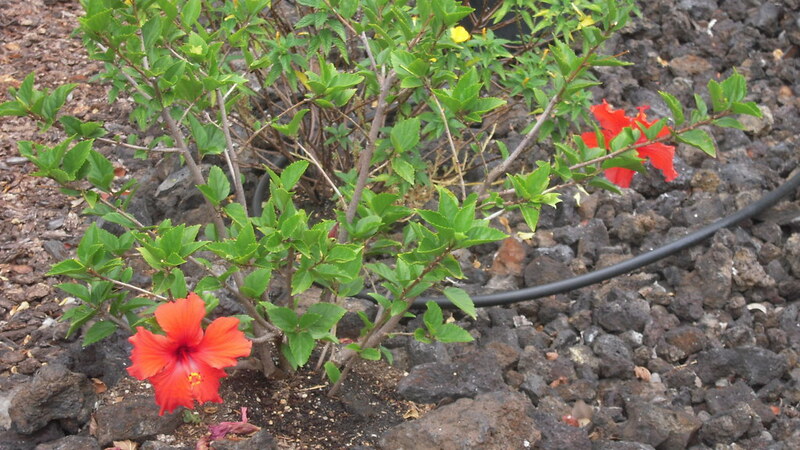 A couple of other native plants they have growing are the Ulei or Hawaiian Rose . . .
. . . and the Hala Pepe. According to Wikipedia, there are seven native Hawaiian hibiscus species. 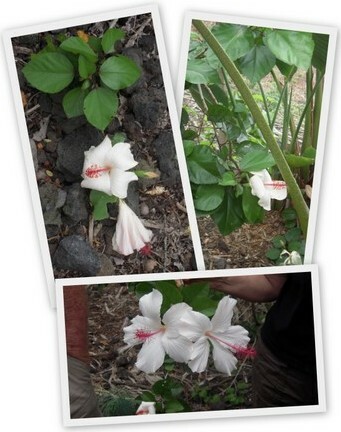 The striking native white hibiscus is one of those. Monty’s primary interest seems to be the palms. Soft paths through the palms were everywhere. 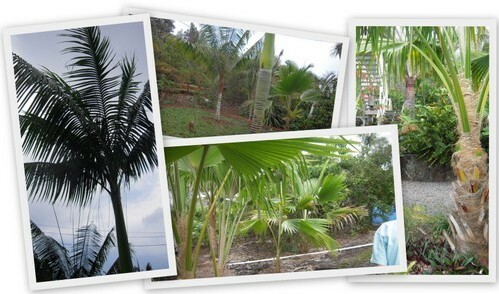 I lost track of how many varieties of palms we saw. It seemed like we walked for miles through palm groves. What rests below the top layer of rocks is one of the factors we all deal with here. 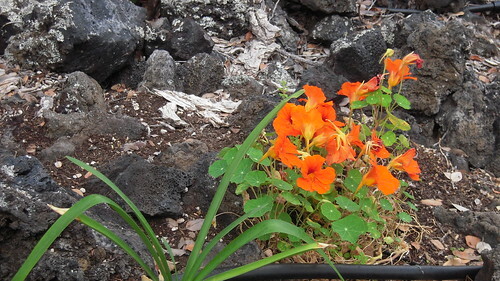 If the drainage is stopped by a solid layer of lava, plants don’t grow well. 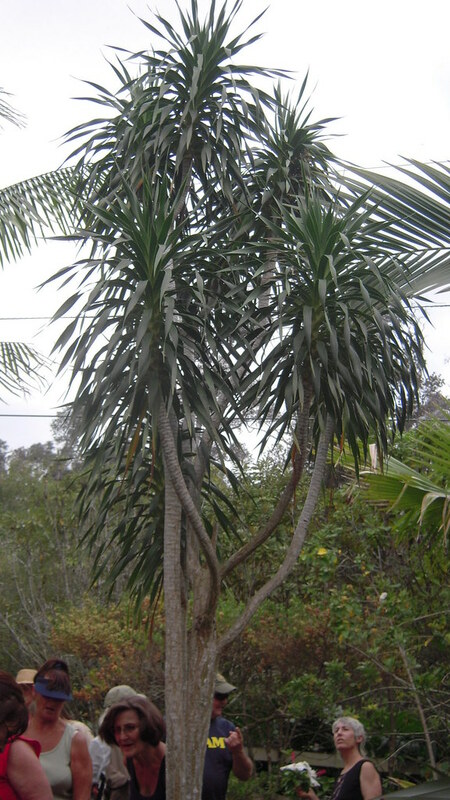 Of those palms planted at the same time, some are quite tall, and others look like they have never grown, due to this layer that hinders root growth. 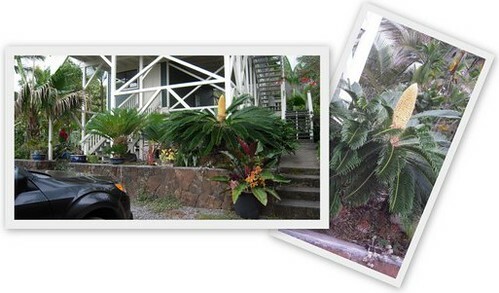 This Fishtail Palm could be one of the largest of its kind. They are rapid growers and intimidate all the other palms. No tropical garden is complete without its anthurium plants. . .
. . . or ginger . . .
. . . or banana. This particular banana is not common. (Dare I say it’s “rare”?) It puts out two stalks of bananas each time. If you look closely, you can see them. 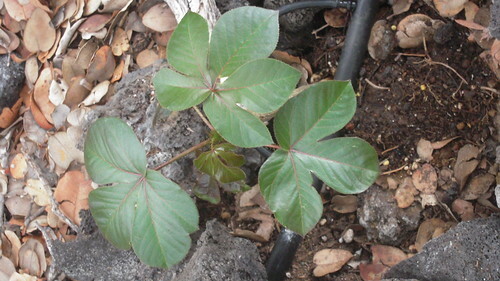 Even the keiki (babies) that come up after the mama plant has died have the double growth. Bob tells the story of them going to a nursery in Pahoa to buy a rhododendron, and came home with 39 of them! He said to place the plant on top of the lava, then mound cinder around it. The roots will go down between the big rocks and the small feeder roots will spread out into the cinder. I’m going to try (just) one, I think. 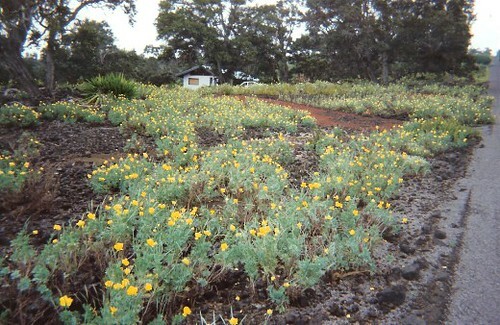 Spots of color were scattered throughout the acreage. 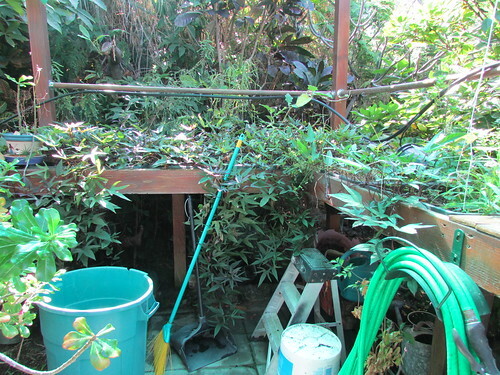 Tucked here and there were other familiar plants, such as donkey tail, ti plants, butterfly bush, and stromanthe. 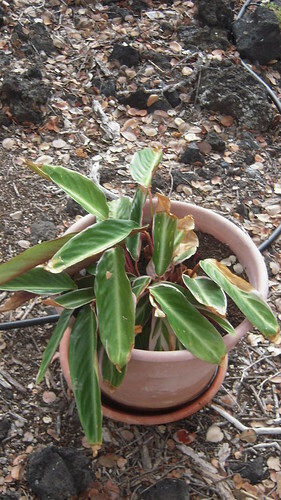 We saw a few familiar plants in a variety that weren’t as typical as what we have in our own gardens, like this tri-colored jade and variegated monstera. 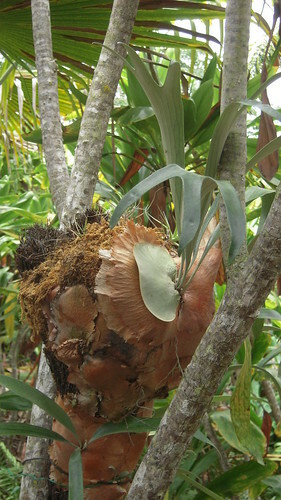 There were several healthy specimens of staghorn fern. 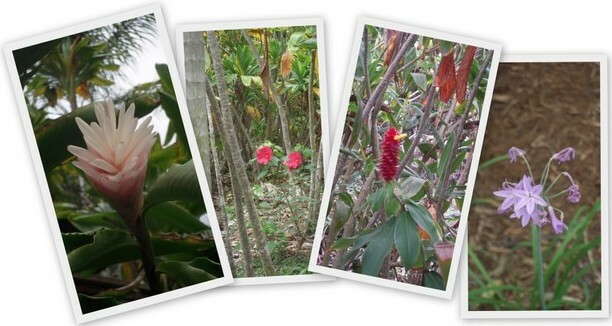 Various protea are usually found in our tropical gardens, like these banksia (not in bloom at this time), king and pincushion proteas shown here. 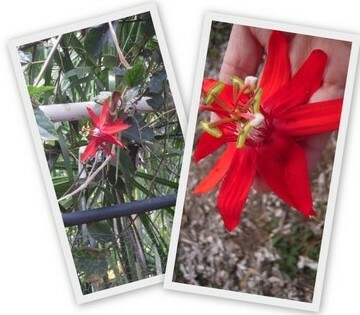 For me, one of the most stunning flowers was the passion flower, not the same as the lilikoi we normally have growing. 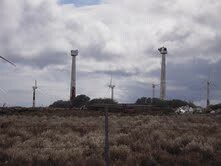 It seems everyone is suffering from either drought, effects of vog, or critters like rats, sheep, pigs, caliche pheasants. A few veggies are still producing here. I particularly loved the delicate little “society garlic.” I was given a few small bulbs to bring home and plant. 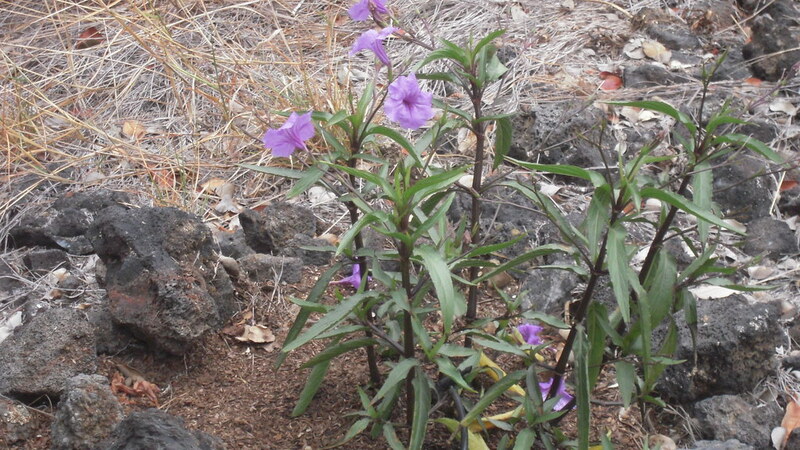 The flower can be tossed into a salad and the flavor is heavenly. My car probably still smells like garlic (not an unpleasant odor for me)! Bob said his primary passion is xeriscaping, which is designed to reduce the amount of water generally needed for growth. That means succulents and other drought-resistant plants. I have some of these in my own garden, and I plan to do more. A touch of serenity concludes the tour. Enjoy this slideshow for more pictures than I could include in this post, and for individual shots of those plants I’ve made into a collage. Click here to view the slideshow. If it takes you to a web page instead of the slide show, click on “slideshow” in the upper left hand corner.